Car Crosses Lane Into Opposite Traffic In Fort Pierce Crash | Schuler, Halvorson, Weisser, Zoeller & Overbeck P.A. A car crossed into the opposite lane in a deadly crash along Emerson Avenue in Fort Pierce. 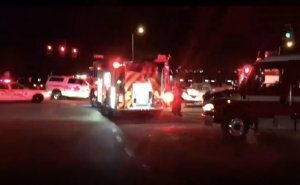 Police are investigating a deadly crash involving two vehicles on Emerson Avenue in Fort Pierce. A black Dodge Charger was traveling northbound on Emerson Avenue at a high speed when he crossed the center divider into the opposite lane and collided with a Nissan Murano which was approaching on the southbound lane. The Dodge collided head on with the Nissan Murano. The impact of the crash caused the Nissan Murano to flip over, coming to rest on its top. The driver of the Murano was ejected from the vehicle during the crash. He was put in an ambulance and rushed to the hospital in critical condition. His front seat passenger was lucky to survive with minor injuries. Police say she had her seat belt on. “One minute he was speeding and the next thing I know, he’s in the air like a flying saucer” said Sarah, an elderly woman who witnessed the crash from a parked vehicle. The driver of the Dodge Charger also suffered multiple fractures in the crash. He was transported to the hospital in an ambulance and is said to be in a stable condition at the moment. Emergency first responders had their hands full with the injured victims and debris littering the southbound lane of Emerson Avenue. Police are conducting an investigation to determine the state of the driver before the crash.